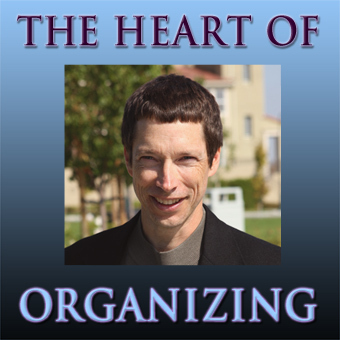 I recently listened to all 25 episodes of THE HEART OF ORGANIZING, a podcast by the veteran San Francisco Bay Area professional organizer Andy Hartman of Clutter Free Services. Andy produced the series in 2009-2011 but it remains just as relevant and inspirational today. Before beginning an organizing project, he encourages listeners to devote serious thought to exactly what they want to achieve and crucially, why. Only once you've determined what is important to you can you select and arrange your possessions to support those values. Sort. Determining categories with whatever level of specificity works for you, and putting like with like. When categories overlap, choose one and cross-reference. Store. Assigning each category a home and if necessary, a container. The stuff you use most often should be most accessible, the size of category should match the size of the space, and ideally the home should match the function (where you use something). The first two steps, simplifying and sorting, can be done in either order or simultaneously. If you have difficulty simplifying, Andy recommends that you sort first to see what you have and where you have redundancies. And simplifying does not have to mean discarding. Andy offers a helpful episode and corresponding webpage with Resources for donating, selling, and re-cycling. If you need motivation to get started, check out his episode on "The Hidden Costs of Stuff." Consider the costs of losing things among the clutter and buying duplicates of what you already own; of late fees and damaged credit score for late bills; of off-site storage of unused belongings and of transporting them when you move. Things deteriorate from non-use. How much does it cost to maintain your things free from dust and pests? Is disorganization impacting your quality of life? Are you serving your stuff, instead of your stuff serving you?